Naushad Moosa’s Bengaluru FC side were held to a 1-1 draw by FC Bengaluru United in what was a physical battle for most parts in a Round-10 encounter of the BDFA Super Division League, at the Bangalore Football Stadium, in Bengaluru on Monday. The point took the Blue Colts’ tally to 25 points with three games left to play as they stay at the summit of the Super Division. After some end-to-end action in the opening quarter of the game, the Blue Colts finally made their possession count, breaking the deadlock from the spot in the 26th minute. 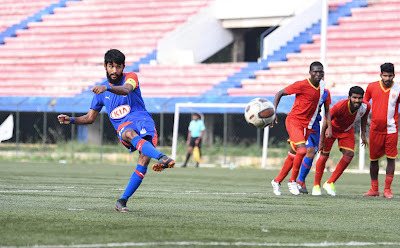 Winger Leon Augustine, who caused trouble for the opposition defence with his frequent forays, was caught by Aashiq’s high foot in the United box, resulting in referee pointing to the spot. Myron stepped up and calmly converted the penalty to give Bengaluru a 1-0 led. Moosa’s boys came close to doubling their advantage when Altamash Sayed, who had netted a brace in the previous game, unleashed a powerful shot from over 35-yards out. Swerving in the air, the midfielder was unlucky to watch his attempt cannon back into play off the crossbar, albeit bouncing inches ahead of the goal-line in the 33rd minute. However, against the run of play it was United who levelled the scores after striker Hamza headed home from close range. The striker was at the right place at the right time and reacted quickly after an initial attempt on a corner had come off the horizontal. The second half saw the Blue Colts attack with intent and camped in the rival half for long spells. BFC had their first chance of the second half just minutes into the second period when Myron’s long ball found Namgyal Bhutia just outside the box. The right-back controlled neatly and attempted a lob over an advanced ’keeper but his effort sailed over. Moosa’s boys kept pushing up and had two more chances only to be denied by the rival custodian. Sairuat Kima’s header on Bhutia’s cross in from the right was parried away before another strike from Altamash was tipped over the bar. The Blue Colts were left frustrated by the rival defense who stayed back to hold them to a 1-1 draw. Bengaluru FC play Jawahar Union next on Thursday, December 20th.